ACID is researching V-Jam video jamming software as a tool for creative engagement with young people at the KYC Trust in Caboolture. Dr Steve Dillon said this V-Jam project is giving young people, who might be disengaged from traditional schooling, opportunities for creative engagement in music performance. The workshops are being held once a week to prepare for a performance at the Caboolture Learning Expo on 8 September, during Adult Learning Week. 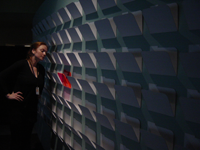 ACID Researcher Ian Gwilt of Creativity and Cognition Studios at UTS opened his /Mundane Traces/ exhibition in Beta_space in the Powerhouse Museum, Sydney, last week, with the opening hosted by Head Curator Matthew Connell. The event, sponsored by ACID, started with a demonstration in Beta_space of six of Ian�s recent artworks featuring desktop iconography such as scroll bars, folders and document pages. This iconography is displaced from its recognizable domain of screen, keyboard, and mouse interaction, and is instead displayed in a museum context where audiences can navigate and contemplate a mixed media discourse of vividly recognizable iconography. 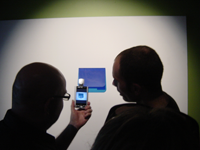 The representational media ranged from rapid image prototyping to sculpture, film and sound installations, and augmented reality displays. 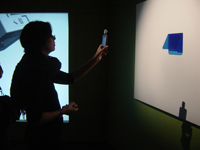 A focal point of the exhibition is the developing AR toolkit software, emerging out of collaboration with the HitLab, New Zealand. Overseen by Ian and ACID Research Leader Mark Billinghurst, Sun Kyoo Hwang of HitLabNZ developed an image recognition software that is triggered by a small camera atop a hand-held mobile device. This trigger produces a random selection of words, a mixture of computer commands and personal pronouns, to bring the analogy of human computer interaction into the realm of augmented reality. After the opening, guests convened in the Level 2 Education Rooms to participate in an artist�s discussion by Ian about his practice and PhD studies. Dr Zafer Bilda is currently evaluating the effectiveness of a sculptural exhibit in Beta_space and the robustness and viability of the AR software. For further information on the Beta_space process, please visit www.betaspace.net.au. ACID Researcher Deb Polson and the team at Newish Media are bringing SCOOT to the world again, this time at the RiverFestival in Brisbane from 7�9 September. Teams of families, friends and trusted contacts sign up as SCOOT agents for this high-tech interactive treasure hunt to find clues and games hidden throughout the South Bank precinct. With the help of the S�Avatars on SMS, SCOOT Agents aim to stop the Pesky Ones taking over our world with their dodgy carnival games. To solve interactive puzzles and complete the mission, SCOOT Agents are directed to both hidden and familiar South Bank landmarks including those in the South Bank Parklands, Grey Street area, the State Library of Queensland, the Maritime Museum, and Hands On Art. Deb said this version of SCOOT has been well supported by the South Bank precinct. �RiverFestival and the South Bank Corporation have been terrific; they�ve really gotten behind SCOOT,� she said. Night missions will run on Friday 7 and Saturday 8 September, and day missions on Saturday 8 and Sunday 9 September. To help save the world from the Pesky Ones, just register online at the official SCOOT Agency site and show up at South Bank. ACID Research Associate Colleen Morgan will present theFigmentum project at the Electrofringe festival in Newcastle NSW on 29 September. Figmentum was Colleen's Honours project, exploring how we may design located information and communication technologies (ICTs) to foster community sentiment. Figmentum is a situated generative art application that was developed for and installed in a new urban development. Through a generative artwork, the work aims to trigger emotional and representational imagined communities. 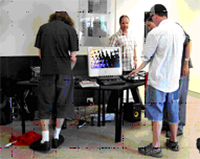 2007 is the tenth anniversary of Electrofringe, the festival of experimental electronic arts and culture dedicated to skills development and artistic exchange. The festival will present workshops, panel discussions, masterclasses, presentations, exhibitions and screenings. Visit the Electrofringe website for more information. 5pm, 4 September 2007, Kelvin Grove QLD. Visit the IGDA site for more info. 10am�2pm, 8 September 2007, The Block, Kelvin Grove QLD. 6pm, 29 September 2007, Newcastle NSW. 26�27 October 2007, Kelvin Grove QLD. visit the CSPP website for more info. OzCHI Doctoral Consortium, 28 November 2007, Adelaide SA. visit the OzCHI website for more info. visit the journal website for more info. Imagining Business: Reflecting on the visual power of management, organising and governine practices, First EIASM Workshop, 26�27 June 2008, Sa�d Business School, Oxford UK. visit the EIASM website for more info. visit the Making Links website for more info. 11 November 2007, Busan KOREA. visit the ISWC website for more info. ISEA2007: International Symposium on Electronic Art, 25�30 July 2008, Singapore. visit the ISEA website for more info.